The first round of China-Afghanistan-Pakistan trilateral Foreign Ministers' dialogue will be held in Beijing on December 26. At the invitation of Foreign Minister Wang Yi, Foreign Minister Salahuddin Rabbani of Afghanistan and Foreign Minister Khawaja Asif of Pakistan will head delegations to attend the dialogue. Q: According to media reports, on December 20, the European Commission issues a report on China, which points fingers at China's socialist market economy. On the same day, the amendment on the new EU investigation rules for anti-dumping entered into force, which introduces the concept of "significant market distortions" and explicitly stipulates that in the case of "significant market distortions", the EU can choose the international benchmark market price or cost or that of a third country to determine whether there exists anti-dumping. What is your comment on this? A: We have noted the relevant information. The relevant report issued by the EU makes irresponsible remarks on China's economic development and takes discriminatory and unfair restrictive measures against China under false pretenses. However, it has not said a single word about its own actions that violate the WTO rules. It is quite hypocritical for the EU to adopt double standards blatantly. In today's world, the interests of all countries have become more and more interwoven. Under such circumstances, it is nothing but carving on gunwale of a moving boat to employ the mentality of zero-sum game to deal with the mutually beneficial and win-win cooperation. It will only end up harming itself as well as others. In recent years, China's economic development has scored historic achievements and witnessed historic transformation, which has not only provided important material conditions for China's reform and development in other areas, but also made significant contributions to the stability and growth of the world economy. The facts have proven that the socialist economic system with Chinese characteristics suits China's realities, meets the needs of China's economic development for a new era and holds a bright prospect. The spokesperson of the Ministry of Commerce has made remarks about the amendment on the new EU investigation rules for anti-dumping. I would like to once again point out and stress that the actions of the EU violate the WTO rules and will undermine the authority of the WTO anti-dumping legal system. As an important member of the WTO, the EU should make its deeds accord with its words, respect international rules and uphold the authority of the multilateral trading regime. We urge the EU side to strictly abide by the WTO rules, fulfill the obligations of international treaties in their entirety and in good faith, avoid abusing trade remedies and uphold the overall picture of China-EU economic cooperation and trade. Meanwhile, the Chinese side will take necessary measures to safeguard its own legitimate rights and interests. Q: The United Nations Special Envoy for Myanmar's human rights conditions Yanghee Lee has been prevented from visiting Myanmar and investigating alleged human rights abuses against the Rohingya people. She said that it was alarming that China was strongly supporting Myanmar and that the international community should persuade China to act to protect human rights. How do you respond to her comments? A: The Chinese side always maintains that the disagreements on the issue of human rights should be addressed through constructive dialogue and cooperation on the basis of equality and mutual respect. As a friendly neighbor, China hopes that Myanmar can enjoy political stability, national harmony and economic development. With regard to the issue of the Rakhine State, we have said on this podium many times that the issue of the Rakhine State belongs to Myanmar's domestic affairs and it involves complicated historical, national and religious factors. We believe that resolving this issue through dialogue and consultation between Myanmar and Bangladesh is the only way out. We have noted that recently Myanmar and Bangladesh have carried out many rounds of interactions, inked the MOU on repatriating the displaced and set up relevant joint working group, which significantly eased the situation there. We believe that the international community should constructively help Myanmar and Bangladesh to make efforts to resolve relevant issues through dialogue and consultation instead of complicating the issue. Q: Palestinian President Mahmoud Abbas has sent a delegation to China and Russia, seeking support for Palestinian-Israeli peace process. Does this mean that China is going to replace the US as a mediator for the peace process? A: China's position on the Palestine issue is consistent. We support and actively promote the Middle East peace process. We support the just cause of the Palestinian people to regain their legitimate national rights. Yesterday I have said that China will hold a symposium of Israeli and Palestinian peace advocates in Beijing from December 21 to 22. Member of the Executive Committee of the Palestinian Liberation Organization Ahmed Majdalani and Deputy Speaker of the Knesset and head of the lobby for the two-state solution Yehiel Bar will head delegations to attend the symposium. Foreign Minister Wang Yi will meet with the Palestinian and Israeli attendees. 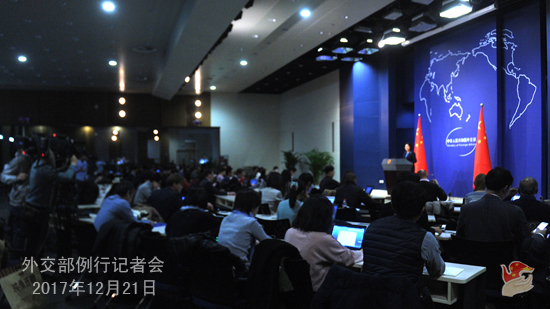 Assistant Foreign Minister Chen Xiaodong will attend the opening ceremony of the symposium. We hope this symposium will serve as a platform for communication and interaction between the Palestinian and Israeli peace advocates in a demonstration of the hope for peace. We are willing to continue offering constructive assistance to promote the Israeli-Palestinian peace process. Q: The New Zealand government has blocked the Chinese conglomerate HNA from buying a firm that had belonged to the ANZ, which is called UDC Finance. Is the Chinese government aware of this case? Have you been discussing it with the New Zealand government? A: I haven't heard of the information mentioned by you. In principle, the Chinese side always encourages the Chinese enterprises to conduct equal and mutually beneficial cooperation with foreign countries in accordance with law and the market rules. 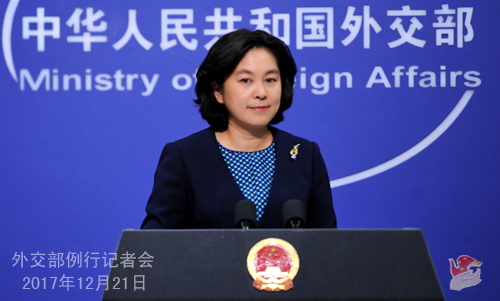 Q: Can you give us more details on the China-Afghanistan-Pakistan trilateral Foreign Ministers' dialogue mechanism and what are China's expectations for this round of dialogue? A: As a common neighbor and friend of Afghanistan and Pakistan, China always supports Afghanistan and Pakistan in living in friendship and achieving common development. In June this year, when Foreign Minister Wang Yi was visiting Afghanistan and Pakistan for shuttle diplomacy, the three countries agreed to establish the China-Afghanistan-Pakistan Foreign Ministers' trilateral dialogue mechanism, which will serve as a platform for enhancing the dialogue and cooperation among the three countries. This will be the first round of China-Afghanistan-Pakistan trilateral Foreign Ministers' dialogue. The three countries will have in-depth communication on three topics, namely, mutual political trust and reconciliation, development cooperation and connectivity and security cooperation and counter-terrorism. The Chinese side hopes that through this dialogue, the three countries can build up consensus, enhance mutual trust, promote the improvement of Afghanistan-Pakistan relations, enhance trilateral cooperation and jointly stay committed to the peace, stability and development of this region. Q: Recently India has expressed unhappiness again over China on the listing of Masood Azhar. India's UN representative Syed Akbaruddin has told the UN Security Council that due to the "narrow political concerns" of some countries, cooperation on counter-terrorism continues to elude within the Council. How would you respond to that? A: With regard to the listing of the 1267 Committee, we have stated our position many times. As the Indian side is concerned about it, we answered relevant questions patiently, earnestly and candidly every time. 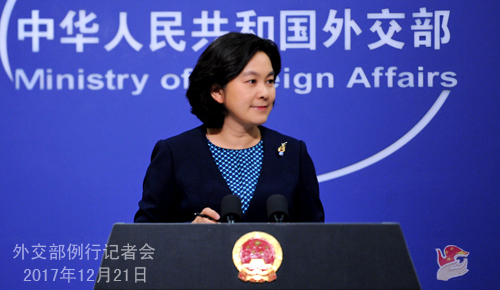 The Chinese side firmly fights against all forms of terrorism and maintains that the international counter-terrorism cooperation should be stepped up. Our resolve and sincerity in this regard are beyond doubt. When it comes to the issue of counter-terrorism, the Chinese side is always making judgments and decisions based on the merits and demerits of the matter. China's relevant actions within the 1267 Committee conform to the relevant UN Security Council resolutions and the deliberation rules of the Committee. We are willing to continue enhancing counter-terrorism and security cooperation at the UN Security Council and other platforms so as to jointly uphold the peace and security of the region and the world at large. The relevant actions of China are open and aboveboard and have nothing to do with the so-called "narrow political concerns". Such kind of label can by no means be pinned on China.